Elijah was a great prophet of God who lived in a time of gross compromise in Israel. As this verse records, drought was used of God as a wake-up call to the nation. Moreover, God used the prophets as His “prosecuting attorneys” to call the people back to the terms of the Old Covenant. Notice verse 1 of 1 Kings 17:1 where we read that Elijah “stood before the LORD.” That is a way of saying that he ordered his life so as to always be at Jehovah’s (YHWH) service. His priority was serving God. His life was oriented so as to face towards God — with a clear conscience. 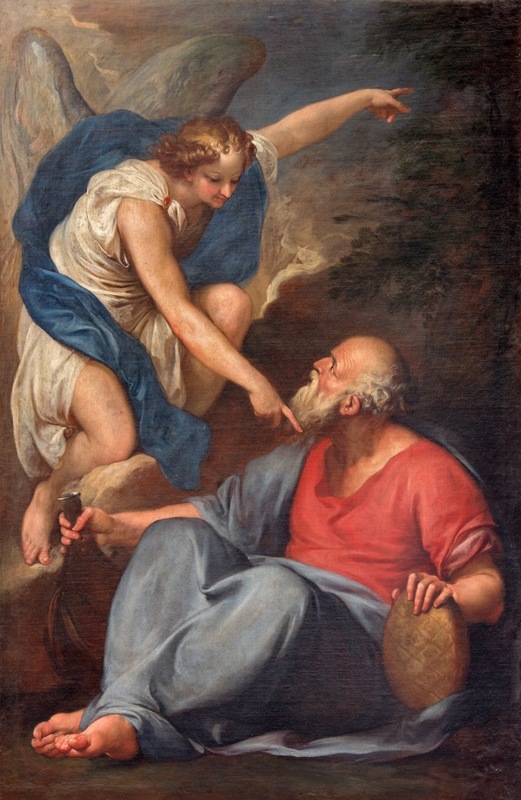 One of the concepts of the presence of God really just means “eye to eye” or “face to face.” Elijah endeavored to live in such a way that nothing came between him and God. Hence, he “stood before Jehovah.” This attitude made him a mighty vessel in the hand of God. The enemy hates “Elijahs.” Consider John the Baptist a “type” of Elijah. Herod’s wife Herodias, tired of hearing John the Baptist rebuke her husband for his sin, plotted to have the man of God beheaded. Sure enough, it happened. John was a type of Elijah and Herodias was a “type” of Jezebel. Ahab is one of the most evil men in the Old Testament. What was worse was his wife Jezebel “stirred him up.” Any time a woman stirs up her husband there is bound to be trouble, but Jezebel was worse in that she was a murderous woman. She made a name for herself by killing off Jehovah’s prophets. (1 Kings 18:4) Anytime there is a Jezebel around she will be looking to take out the true men of God and replace them with compromisers who try to straddle both God and the Devil (fence-riders). It is sometimes said that the nut never falls far from the tree. Jezebel was the daughter of Ethbaal, king of Sidon (1 Kings 16:31), formerly a priest of Astarte, and who had made his way to the throne by the murder of his predecessor Pheles. She lived in a time when the northern tribe of Israel was integrating Baal worship into their Jehovah worship (sound like today?). She even had 400 of her own prophets! Well, they were prophets of Baal. These would use either demon inspiration or they would simply “prophesy out of their own heart words that God has not spoken.” This came to a head prior to Babylon when God spoke through Jeremiah, “Thus saith the LORD of hosts, Hearken not unto the words of the prophets that prophesy unto you: they make you vain: they speak a vision of their own heart, and not out of the mouth of the LORD. I have not sent these prophets, yet they ran: I have not spoken to them, yet they prophesied.” (Jeremiah 23:16, 21 KJV) These are sobering words. Again, Jezebel tried to exterminate the true prophets of Jehovah (1 Kings 18:13), and inaugurated the worship of Baal the Sun-God. As we mentioned before, her father Ethbaal was a ruthless politician who murdered his competition for position in society. These are standard politics. Any time there is a political element to something there will be ungodly conflict and behavior. This is why Jesus strictly forbade politics in the churches. Men cannot rightly love one another when they are fighting over the same office or title. Sadly, when this happens in the Christian denominations men will slander one another and work against each other to gain political advantage. There can never be unity when preachers double as politicians. Selah. There can never be unity when men jockey for power and titles. In the time of Jesus the scribes and pharisees sat in Moses’ seat. They arrogated this role to themselves as they slowly became proficient at teaching the word to people — a job that was reserved for the priests. In modern times men love to set in Jesus’ seat (as it were). They want to arrogate to themselves authority that belongs to the Lord only. They love the best places at feasts, the best seats in the synagogues,greetings in the marketplaces, and to be called by men, “Rabbi, Rabbi. (Matthew 23:6–7 NKJV) Notice they love titles. They want to be called by their title. “Rabbi, Rabbi, etc.” Jesus then adds, Do not be called leaders; for One is your Leader, that is, Christ (Matthew 23:10 NASB) Men want to set in that leader spot that belongs to Jesus, but we can’t allow it. No need for help from a theologian, a kindergartner can understand Matthew 23:10. Jezebel, learning the evil craft of back-room politics from her father Ethbaal, murdered to get what she wanted — just like he did. Her ego was so large that she defied anyone to cross her or her husband. When Naboth refused to sell Ahab his land, Jezebel conspired to have the man killed. She mocked Ahab as if to say, “Are you the king or not?” Her attitude was that the leader is king and the king gets what he wants. Consider also that she murdered the dissenting voices around her (the prophets) and sought to set herself up in effect as a prophetess. You may wonder how a person could possibly teach and seduce people into fornication within the church. I’ll give you a possible scenario. Say that a young couple within the church are in a relationship. A “Jezebel” (the Devil’s matchmaker), calls one of the pair aside and “gives them a word” or “helps them get some discernment” that leads to a break up of the relationship. Down the road the young lady, who broke up with the young Christian man, starts fornicating with a rich Catholic guy, gets pregnant, and never returns to her church again. What happened? The Jezebel caused the couple to miss God’s will because she/he intruded into the couples’ personal business. The Jezebel, believing they were hearing from God (while actively resisting His dealings), taught and seduced God’s servants to commit sexual immorality. It may never be viewed this way, but this was the outcome of the false advice and influence. They fell in the faith and both backslid. When a Christian marries a non-Christian or any “unequally yoked” situation, they will almost always serve the compromiser or sinners’ god (whatever their god is). Is there any wonder God told them, I will cast her into a sickbed, and those who commit adultery with her into great tribulation, unless they repent of their deeds. Jezebel was a tool in the hand of the Devil in the time of Elijah and she still is today. She used her influence to work against the plan of God in Israel and she uses her influence to thwart God’s plans in the churches. If you look around and see great destruction and discouragement, you probably have a Jezebel or two (or more) working. Elijah became so dispirited by her antics that he went out and hid in a cave. He stopped “standing before the Lord.” This was the Devil’s plan! Satan hates it when people stand before the Lord. He sends his Jezebels out in droves and anyone else he can use to stop men from living in God’s will. What can be done? In a figure, the Jezebels of the churches need to be thrown down. Consider closely what Jesus said, “Nevertheless I have a few things against you, because you allow that woman Jezebel…” These people at Thyatira refused to deal with the Jezebel in their church. Perhaps they were too busy pointing fingers and calling each other Jezebel to know who the true Jezebel was? Nevertheless, God intervened. And I gave her time to repent of her sexual immorality, and she did not repent. Indeed I will cast her into a sickbed, and those who commit adultery with her into great tribulation, unless they repent of their deeds. Not all sickness is a result of someones sin, but sometimes it is. When people (notice the plural in the word “those”) refuse to listen to God He is liable to cast them all into a sickbed — not so that they would repent, but because they refused to repent. We must be aware of these people in the world (and the churches) who are agents of Satan meant to turn us out of the way. At the least they will work to get our attention off of “standing before the Lord” and get us all riled, depressed, or turned to distractions. We have to stay pointed towards God and standing before him. Elijah went from standing before the Lord to running from Jezebel. It can happen. We can’t allow the Devil to tempt us to do it! Ignore the Jezebels if they are not being dealt with. Stay focused on what God is saying to you and on what God wants done through you. We are here to serve Him — not respond to all of Jezebel’s antics. Time proved that God dealt with Jezebel. If Elijah had known her end he probably wouldn’t have ran from her — he would have remained focused “standing before the Lord.” Likewise God is going to deal with the Jezebels of this present world. May we stand before the Lord in the months and years to come.